With Winter comes a rather large decrease in ambient humidity leaving skin and hair thirsty and dehydrated. High quality shampoos and conditioners play an important role in setting the correct moisture quotient to keep your hair shiny and manageable. That is until you start moving around in heated air-conditioning, pretty soon sucking all the available hair moisture from all your efforts even after using the best haircare products. To combat this loss of moisture hairdressers usually turn to a serum based product helping to seal the hair against dry, moisture draining air. When it comes to a serum for this kind of job, Gold stylists turn to Moroccan Oil. 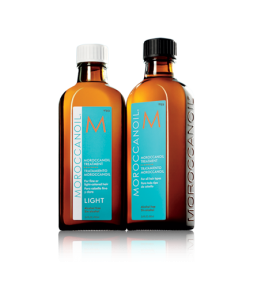 Coming in two different weights to suit both thicker and finer hair types, Moroccan Oil’s high quality cosmetic grade silicones, naturally derived from beach sand, silicone act as a lightweight lubricant making the surface of your hair feel smooth without leaving a heavy residue. So if you a fighting static with your fine hair or fluffiness in thicker hair types, a couple of drops of Moroccan Oil worked into the palms of your hands then spread evenly throughout the lengths of your hair will make a noticeable difference to how smooth and manageable your hair will look over the coming months. Anything as universally beneficial as Moroccan Oil and Moroccan Oil Light deserves our little accolade of HERO product of the month!